It’s getting to be common news for a Chinese company (usually with links to the government) to buy a foreign commodities producer to secure supplies of coal, oil, iron ore and other assets to fulfil the country’s ambitious growth plans. China is not alone on this shopping spree. We came across some new data, for example, that shows a clear trend of emerging-market countries increasing their ownership stakes of companies in the developed world. This is yet another indicator of the shifting balance in global wealth from the developed toward the emerging economies. 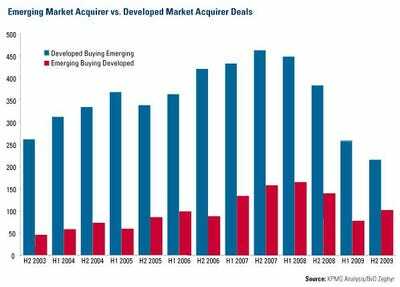 China, the Middle East and India led a rebound in the number of emerging-market entities acquiring developed-world companies (E2D), according to *KPMG’s Emerging Markets International Acquisition Tracker (EMIAT). What really stands out to us on this chart is the fall-off in developed market buying from 2007, though that’s not particularly surprising given the economic crisis. The question is whether it will come back, or whether the crisis set in motion a permanent change in direction, whereby developed markets continue to engage in fewer and fewer resource deals (at least as a percentage of the total. It’d be hart not to see the red bar moving up significantly either way.